I'm stuck. 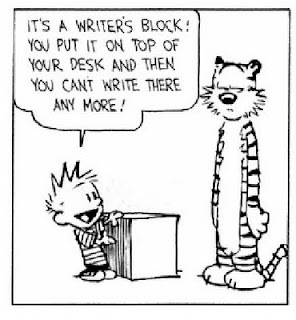 I know that some of you probably don't believe in writer's block, but I am officially stuck. Everything I've written the past week has been terrible and I literally delete it all. I can't seem to find my writing "groove" again. In some ways, I think it's been understandable to have some difficulty since the death of my friend, but it's been two weeks and I want to write again. I just can't seem to get motivated or inspired to write like I normally do. It's like my hands and my head don't want to agree anymore. I can't even make this blog post seem creative... gaaaaah! I TOTALLY get like that sometimes. The only thing I recommend is waiting it out, because nothing good ever comes from forced writing. I would recommend reading a good book (for inspiration) or reading over something you've written in the past that you're really proud of (to help your confidence). I have been there - recently actually. I don't actually have a formula that always works for me. It seems to be different every time. But here are some things that have worked for me in the past. One time I was stuck because I could not make decisions - so I started flipping a coin. It actually was kind of fun and sparked a lot of good ideas. Another time I wrote a scene between two of my characters - which never actually takes place in the story - but they were just talking about hopes and dreams and stuff. It really helped to write something out of the plot that helped me get to know my characters better. And... well one time I decided to play around with throwing in a totally wacky plot twist. I saved my MS into another file and just threw something random into the scene I was writing. I did not end up keeping what I wrote but it did get the juices flowing again. Not sure any of that will help. Best of luck and keep writing. Those are some great ideas - Thanks Angela and Krista! I go for a long walk with my Ipod and try to wipe my mind blank. Stuff usually bubbles up. 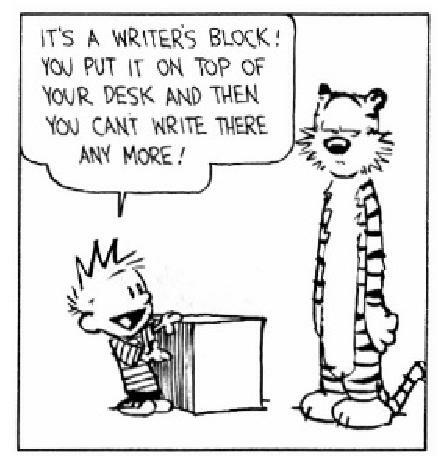 Or I will write anything, anything at all, and not stop because I know it's awful. Sometimes that helps. Good luck!